An impeller (also written as impellor or impellar) is a rotor used to increase (or decrease in case of turbines) the pressure and flow of a fluid. An impeller is a rotating component of a centrifugal pump which transfers energy from the motor that drives the pump to the fluid being pumped by accelerating the fluid outwards from the center of rotation. The velocity achieved by the impeller transfers into pressure when the outward movement of the fluid is confined by the pump casing. An impeller is usually a short cylinder with an open inlet (called an eye) to accept incoming fluid, vanes to push the fluid radially, and a splined, keyed, or threaded bore to accept a drive shaft. The impeller made out of cast material in many cases may be called rotor, also. It is cheaper to cast the radial impeller right in the support it is fitted on, which is put in motion by the gearbox from an electric motor, combustion engine or by steam driven turbine. The rotor usually names both the spindle and the impeller when they are mounted by bolts. In a failing heart, mechanical circulatory devices often utilize a continuous axial-flow impeller pump design. The main part of a centrifugal compressor is the impeller. An open impeller has no cover, therefore it can work at higher speeds. A compressor with a covered impeller can have more stages than one that has an open impeller. Some impellers are similar to small propellers but without the large blades. Among other uses, they are used in water jets to power high speed boats. Since impellers have no large blades to turn, they can spin at much higher speeds than propellers. The water forced through the impeller is channelled by the housing, creating a water jet that propels the vessel forward. The housing is normally tapered into a nozzle to increase the speed of the water, which also creates a Venturi effect in which low pressure behind the impeller pulls more water towards the blades, tending to increase the speed. To work efficiently, there must be a close fit between the impeller and the housing. The housing is normally fitted with a replaceable wear ring which tends to wear as sand or other particles are thrown against the housing side by the impeller. Vessels using impellers are normally steered by changing the direction of the water jet. Compare to propeller and jet aircraft engines. Axial flow impeller (left) and radial flow impeller (right). 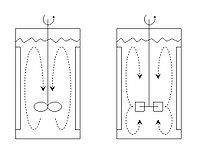 Impellers in agitated tanks are used to mix fluids or slurry in the tank. This can be used to combine materials in the form of solids, liquids and gas. Mixing the fluids in a tank is very important if there are gradients in conditions such as temperature or concentration. Radial flow impellers impose essentially shear stress to the fluid, and are used, for example, to mix immiscible liquids or in general when there is a deformable interface to break. Another application of radial flow impellers are the mixing of very viscous fluids. Axial flow impellers impose essentially bulk motion, and are used on homogenization processes, in which increased fluid volumetric flow rate is important. All these can be discussed immediately after example. If one heats a pot of soup on the stove the pot will develop a temperature gradient, (warmest on the bottom and cooler at the surface). Mild agitation will increase the rate of heating by dissipating the heat through the entire pot. See: Law of cooling (which also applies to heating). Even more significant, agitation disturbs the soup directly in contact with the hotter pot surface. Highly turbulent flow at the warming surface is important to good heat transfer. This is the same effect as the "wind chill" factor where moving air and turbulent action on surfaces (like those on people) resulting in significantly enhanced heat transfer. In unusual circumstances, overly-severe agitation may decrease the rate of heating which defeats the purpose. Propellers are axial thrust-giving elements. These elements give a very high degree of swirling in the vessel. The flow pattern generated in the fluid resembles a helix. Agitator for a laundromat washing machine. Some constructions of top loading washing machines use impellers to agitate the laundry during washing. Fire services in the United Kingdom and many countries of the Commonwealth use a stylized depiction of an impeller as a rank badge. Officers wear one or more on their epaulettes or the collar of their firefighting uniform as an equivalent to the "pips" worn by the army and police. Impellers are an integral part of axial-flow pump (AFPs), used in ventricular assist devices to augment or fully replace cardiac function. Air pumps, such as the roots blower, use meshing impellers to move air through a system. Applications include blast furnaces, ventilation systems, and superchargers for internal combustion engines. ^ "impeller, n.". OED Online. March 2013. Oxford University Press. 20 March 2013 . ^ Manuals, Seloc Marine. Volvo Penta Stern Drives 2003-2012: Gasoline Engines & Drive Systems (Seloc Marine Manuals. Seloc Publishing. ISBN 978-0893300746. ^ Miller, LW; Pagani, FD (2007). "Use of a continuous-flow device in patients awaiting heart transplantation". N Engl J Med. 357 (9): 885–96. doi:10.1056/nejmoa067758. PMID 17761592. ^ Chou, N. K.; Wang, S. S.; Chu, S. H.; Chen, Y. S.; Lin, Y. H.; Chang, C. J.; Shyu, J. J.; Jan, G. J. (2001). "Physiologic analysis of cardiac cycle in an implantable impeller centrifugal left ventricular assist device". Artificial Organs. 25 (8): 613–6. doi:10.1046/j.1525-1594.2001.025008613.x. PMID 11531711. Wikimedia Commons has media related to impellers. This page was last edited on 1 February 2019, at 01:43 (UTC).